Attending the Seminar were the leaders of Board of Directors, Executive Board, Trade Union and the representatives of functional divisions. 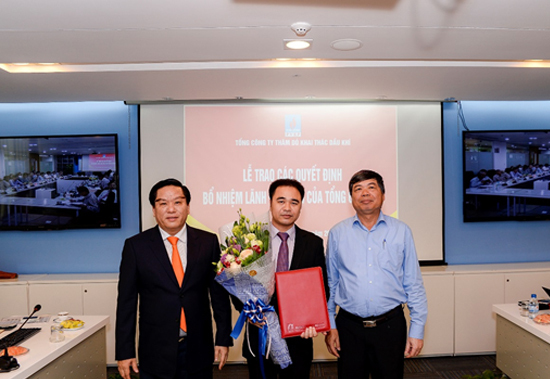 At the beginning of the seminar, the representative of Human Resources Division granted the appointment decisions and presented flowers to Mr. Do Cao Loi, former Head of the Office for Organization and Administration of PVEP Ho Chi Minh’s Integrated Technical Center to hold the position of Deputy General Manager in charge of Human Resources Division from the date of 4th April 2016; and to Mr. Tran Duy Khang, former Deputy Head of Drilling of Lam Son JOC to hold Deputy General Manager of Drilling Division in PVEP Ho Chi Minh Branch from the date of 28th March 2016. 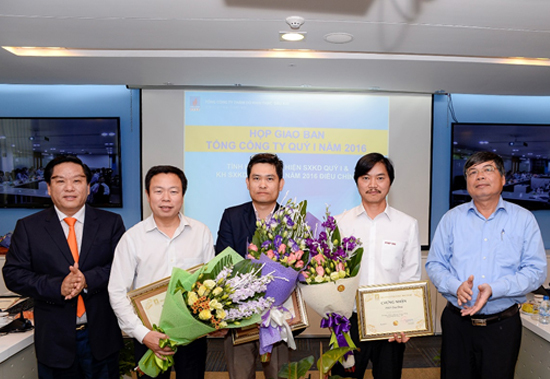 Dr. Hoang Ngoc Dang – Chairman and Dr. Ngo Huu Hai – President & CEO congratulated Mr. Do Cao Loi for his new position. In 2016, the stage of production and business activities becomes more difficult for PVEP compared with its in 2015 due to the low oil prices forecasts of 30-40 USD/barrel, leading to the huge pressure on the financial balance and capital arrangement. In the first quarter of 2016, PVEP basically completed the production target: 1.15 million tons of oil and condensate, equal to 103% of the first quarter plan and 29% of the year plan; 335 million m3 of gas, equal to 113% of the first quarter plan and 31% of the year plan. The total first quarter revenue was expected to reach 6.647 billion VNĐ, equal to 66.4% and 17.3% plan of first quarter and year respectively. The state budget contribution is estimated 2,210 billion VNĐ, equal to 67.7% and 17.7% plan of first quarter and year respectively. Besides, the investment activities in all projects was closely followed to the optimized investment plan while continuing to review carefully, optimize costs in line with the current situation. The total value of investment in the first quarter was estimated at 68.6 million USD (equivalent to 1,543 billion VND), reaching 67.1% and 16.1% plan of first quarter and year, respectively. To balance and minimize financial risks, PVEP has established working teams to participate in negotiations on finance and trade aimed to expending debts, arranging capitals as well as reducing the service cost from supplier. The success of these working teams has helped PVEP to lower the financial burden, therefore maintaining business at the present time. PVEP’s leader highly appreciated and decided to honor their special contributions by presenting them the merit award. The first day of the second quarter there were positive signs as oil prices have rebounded and approached the 45 USD / barrel, and the positive forecasts about the prospects for oil prices will return true value its the end of the year, full of hope PVEP complete business plan targets in the set.